Tank-top Tyler – Even if he is headed to New York or Colorado, “Tank-top Tyler” looks like he is getting an early jump on his beach vacation. Flip-flops, a brightly colored sleeveless shirt, and jorts or “jams” shorts are his usual uniform. On the one hand, I am amazed by and even admire this guy. He throws convention to the wind and dresses like he did when he was a lifeguard during his summer break between 10th and 11th grades. Also, I’m pretty impressed that he doesn’t seem to get cold when the plane temperature inevitable drops about 30 degrees when it hits 15,000 feet. On the other hand, though, I despise this guy for two simple reasons. Airplane seats are close. Too close. With nothing between you and his sweat glands, the odor can sometimes be pungent. Also given the close proximity of the seats, it is never appetizing having to look at dude leg and pit hair from close range for an entire flight. “Headphones Harry” sitting next to me today. Headphones Harry – I love this guy. “Headphones Harry” HATES you even though he doesn’t know you. Maybe not hate, but he does find your company exceedingly annoying. As he squeezes in the seat next to you, he looks stressed, annoyed, and even a bit perturbed. The fact that he is being forced to sit next to you, the peasant that you are, for the next few hours is beyond his comprehension. “Harry” is the guy who, as soon as he sits he pops on his headphones. Not just any headphones, but rather headphones which could double as a motorcycle or football helmet. They look like he just came from a recording studio working on the latest Katy Perry album or flew a B-52 Bomber during World War II. He does this so he can enjoy some music on board AND, more importantly, so he can try to forget you are sitting next to him. 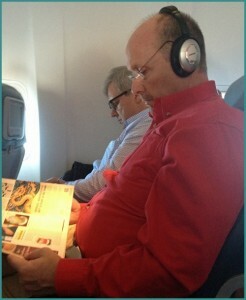 I snapped a pic of my latest “Headphones Harry” who was sitting next to me on this flight. As far as he is concerned, I do not exist. Connector Carl – This guy is ALWAYS stressed. He, like half of the rest of the plane, is trying to make another connection flight. He asks the flight attendants about every 15 minutes if there is an update on the arrival time. “Ma’am, do you know the gate numbers of where this flight will arrive and the one where flight 783 to Boston will depart?” We know you only have 30 minutes to make your connection and so do we! Just please stop acting like you are the only one on this flight! Talkative Thomas – My “Talkative Thomas” today was actually named Michael. He was nice enough, but man could he talk. He teaches business in China and was really excited to tell me all about it. In the end, this type of guy seems to have two factors prompting him to want to talk. First, he is really nervous about flying. Second, he is really lonely in life. In both cases, I should be more patient and kind in listening. He shouldn’t annoy me, yet he often does. Dude, please read a book or take a nap or just look outside to make sure the engine on the wing doesn’t blow up! (Asia) Expert Edward – When “Expert Edward” and I exchange pleasantries and he finds out I live in Asia, he goes crazy with unloading ALL he knows about the country. He and his wife visited my Asian country ten years ago and now he wants to tall me ALL about it. He doesn’t stop there. He tells about the politics of the COUNTRY I HAVE LIVED IN FOR 12+ YEARS AND HAVE STUDIED AT A GRADUATE LEVEL, as if I understand nothing about it. This guy is nice and he means well. For the most part, I can direct the conversation and enjoy my time with ole’ Edward. However, he is not a restful guy to sit next to while I’m just wanting to turn on my computer and watch the latest “Parks and Recreation” while on this flight. Angry Internet Isaac – What was it, about 3-4 years ago when they first introduced in-flight internet service? Yet “Isaac” is incensed when the plane’s internet at 15,000 above the earth’s surface doesn’t work with the speed and consistency which it does at his home. This guy really annoys me. Just be grateful for what you DO have! Happy Henry – This guy I like. Everything is good with “Happy Henry”. Everything. Though he tends to be a bit too talkative for my tastes, he is still such a nice and pleasant fellow that you can’t help but feel better by just being around him. The vacation he is about to take is going to be tremendous. OR he is thrilled to be going to see his uber successful child. OR he is a professor on the last leg of a wonderful trip lecturing in Cairo. He had a great time AND he is excited to get back to his family. “Happy Henry’s” positivity can’t help but to rub off on me, especially given the fact that I am almost always tired and worn out when flying. I’ll be back to writing more “normal” posts, as I am finally back in Asia (as of last night). As always, thanks for reading and hanging out with me on this blog! So which one of these would your seat-mate assign to you? Unfortunately, I have to fall into the headphones category. Not proud of it, but try. That’s funny! And accurate. I’m Headphones Harry by the way. I didn’t say it, but I am also! Who still uses the word jams to refer to shorts? This guy. I honestly had no idea what to call them, so I went all the way back to high school for that one. I like the way you write. 🙂 It makes me smile; and chuckle… i hope I get to board a plane sometime in 2014. It’s been a while… and I get an itch at least twice a year. I know, you have your fill… but thanks for sharing and making the most of it. Hope the flight attendant blesses you with a warm, clean wash clothe when you rouse from a long overnight flight! That is my favorite… i don’t even know if they still do that! Thanks Tammie for letting me know you enjoyed this and for adding your thoughts here. I’m also a big, big fan of the hot towels. Definitely take full advantage of those when offered to me! What’s the name of the guy who takes selfies on a plane?? “Way Cool Wyman” – I think that is a good name for him. Love this – so true! Might want to add an addendum to Tank top Tyler – aka ‘hipster’ in today’s modern American english. Trying to be cool by trying to not be cool. Trying too hard to not try. Also – ‘Businessman Barry’ – flown so many times that he is more comfortable sleeping on a plane than his own house. Within seconds of sitting in the plane, he is unconscious for the remainder of the flight. Of course, he always has the aisle as well, which makes it extremely uncomfortable for his row. I think you probably covered this on your other plane post (last year). My dad could sleep 90% of a flight without even waking up, even would gets up 3-4 times a night at home! Man, I HATE being on the inside row. It is definitely as a result of this guy. So awkward when you want to get out. I swear, it makes me feel like I need to use the bathroom more than I actually do. Very mental being trapped in by a sleeper like you talk about here. I was led to your blog via Ruthie Dean’s and this is hilariously accurate! However, there should be one more added category of ‘Inappropriate Isaac’…or Ian…or some other “I” name. These creepy gents discuss inappropriate things and have trouble keeping respectable physical boundaries. Traveling has always brought out the weirdos for me:) I look forward to reading more of your writings. Blessings brother! Thanks, Natalie, for reading, letting me know you enjoy it, and adding your thoughts in this comment! Ruthie is great and an incredible writer. Yeah, I see these guys from afar, but obviously have not know their wrath. As a member of the male gender, I apologize for these guys! – I laughed at the pic you chose for the title of the post, only because it clearly wasn’t taken on an “american domestic flight”. – Happy Henry is a myth. Only your “glass is way too half full” outlook on life could have made up such ridiculousness. That yahoo doesn’t exist. – You forgot Drunk Dave and Medicated Marvin, both of whom could impersonate Happy Henry. – I was hoping no one would notice. 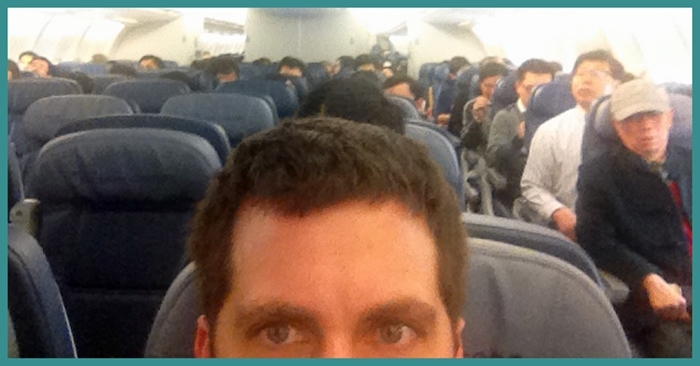 My pics from my domestic flight were all blurry, so I had to do it on my Trans-Pacific leg. How in the world could you tell?!?!?!. . . kidding. – Yeah, I might have been generous in trying not to sound completely cynical in this article. Actually, he does exist, but he’s just few and far between. – Man, I can’t believe I missed the drunk and medicated angles. Great catch of my huge oversight. – She’s strange, but I’m not above her catchy and soulful jingles. Great hearing from you, me friend. DYKWIA David – DYKWIA (Do You Know Who I Am) David is a top level frequent flier with all the benefits, and he wants everyone to know it. This is the guy who lines up to board 20-30 min before boarding begins, planted at the very front of the elite boarding line, bluetooth in ear, trying to look busy. If he is ‘late’ and is merely in the boarding area just before the process starts, he is the guy who asks “Have they started boarding First class yet?” when he is fully aware that First class always starts the boarding process. Revisionist Renee – She comes in all forms. There’s the form that revises history and laments the decline of air travel and how they used to feed you and you had acres of legroom on board, when in fact airplane food has always sucked and while domestic U.S. air travel is driving to the cheapest experience continually, it also costs a lot less in today’s dollars and connects you to more places, more quickly, and more safely. Another form tries to revise policy on the spot, saying, “but they let me do it last time” when trying to board well out of order or heave on board the vastly oversized piece of luggage. Tank-top Tyler is also the type to use the airplane lav in bare feet or socks, per your other list. Man, I am rolling about the “Tank-top Tyler” comment here. I’m literally making my cringing, disgusted face as I type this. Gross. I love both of the others also. I love it for you that your Seahawks won last night. . . I’m a huge Russell Wilson fan (along with pretty much the rest of the free world)! I’ve had such a good laugh reading, great post and great comments! Thanks Iulia. . . I agree, great comments on this one. Fun to have some of my more cynical friends which are frequent travelers chime in on this one! Connector Carl… Classic. You got me on that one. Nice. . . I’m sure it only adds to the stress when you travel with all of your kids! I HATE feeling stressed with the potential of missing a flight. You are braver than I, as I will not get close to that point for fear of a heart attack. In addition to the stuff people that you have referenced here, I guess there is also the folks who sleep and fall on you. I despise this! Thanks for your comment here. . . great stuff! Thanks Alexis. . . good to be back! I promise to NOT write about such a person; no worries. Thanks for letting me know, though, as this is definitely a “type” you fit into with this always moving thing! Love it ! Lots of smiles ! You are loaded with wit & wisdom. Hugs from ATL. This made me laugh heartily! I’ve flown only a handful of times; I’ve sat by both Headphones Harry and Happy Henry, and related to them both. It’s quite hilarious that you’ve done this often, that you could write a comic about it. Well done!